Heat the Kombu and dried bonito flakes in a large pan over a medium heat. Simmer for about 15 minutes. Sieve with a kitchen pepper to make clear soup. Meanwhile, place the deep fried bean curd in the bowl and pour the hot water to remove any excess oil. Drain them. 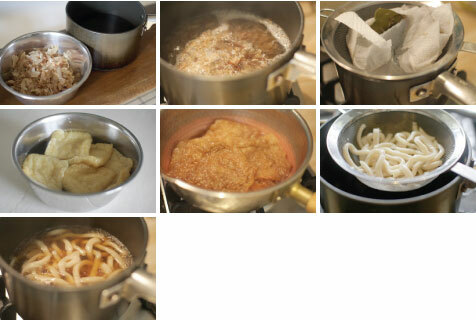 Boil the Udon noodles for about 5 minutes and rinse with cold running water and drain them. Heat the 1200ml soup in a pan and add the soy sauce, mirin and salt. Add the noodles to warm. 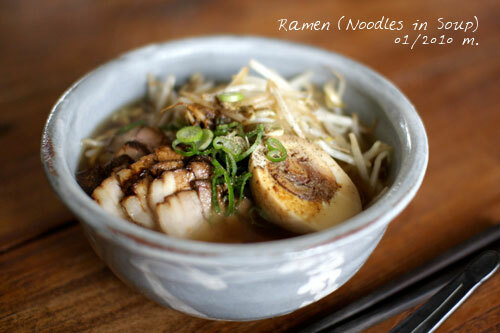 Divide the noodle and soup in the individual bowl. Arrange the Kitsune (deep fried bean curd) and sprinkle with the onion. Serve immediately. Place the flour and strong flour in a bowl. Mix together the salt and water. Pour the salted water little by little with chopsticks onto the flour mixture to make crumble. Press to make dough and take out the dough from the bowl. Knead for about 10 minutes to make smooth dough. Put into the re-closable bag and step with your feet. 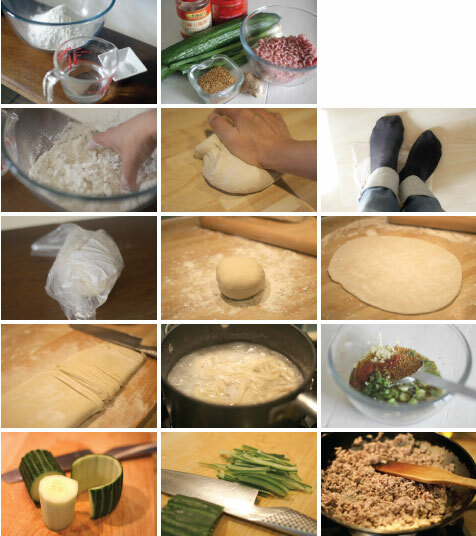 When the dough is spread about 30 cm by 40cm, fold quarter and step again. Repeat this 3~4 times for about 5 minutes. Make a ball ant put it back into the bag then leave for about 30 minutes to 3 hours at a room temperature. Dust with the potato starch on the surface of dough and table top. Spread the dough about 30 cm by 40cm fold into 3. Slice 3mm width then dust with potato starch to prevent sticking together. Boil about 4ℓ hot water bring to simmer. Boil the noodles for about 6~7 minutes or until they are cooked. Drain them. Meanwhile, mix together the all ingredients for the sauce. Cut cucumber into 4~5 cm length then remove the white core. Julienne the cucumber. Heat the oil in the frying pan for over a medium heat. 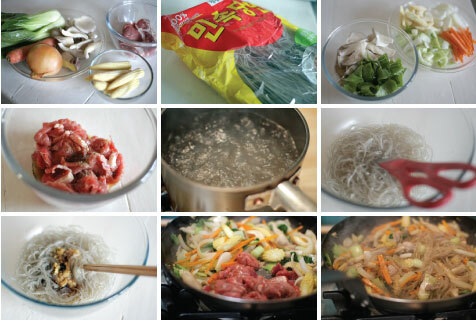 Stir fry the pork mince until they are coloured. Add the Shàoxīngjiǔ and a little sauce. 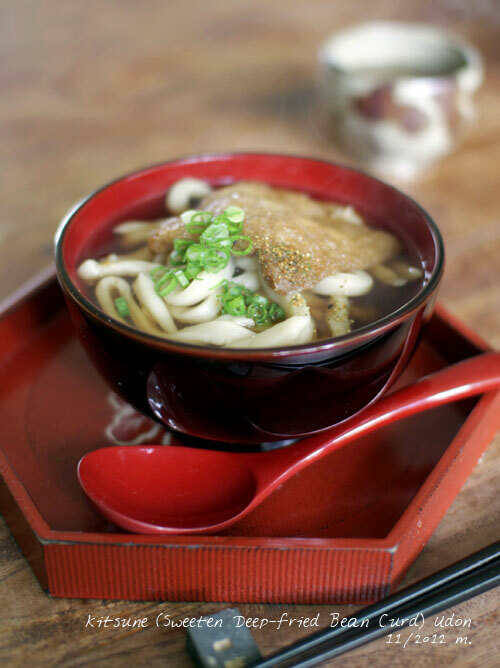 Arrange the Udon noodle into individual bowl. Top with cucumber and pork mince. Serve with the sauce. Marinate the beef in the half of garlic, ginger, 1 tbsp pear juice, 1tsp soy sauce, sake, sesame oil, salt and pepper. Bring to hot water and add a little soy sauce and oil. Boil the noodles for about 5 minutes. Drain and dress the remaining garlic, ginger, pear juice, 2 tsp soy sauce and a little sesame oil. Heat the sesame oil in the frying pan over a medium heat. 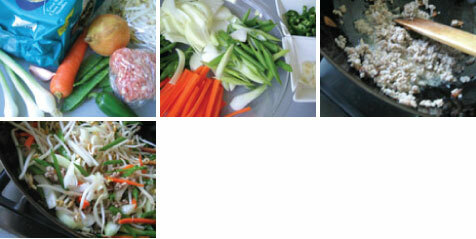 Stir fry the vegetables and season with the salt and pepper. Add the 1 tbsp sake. Stir into marinaded beef and cook for a 2,3 minutes. Add the noodles and adjust with salt and pepper. 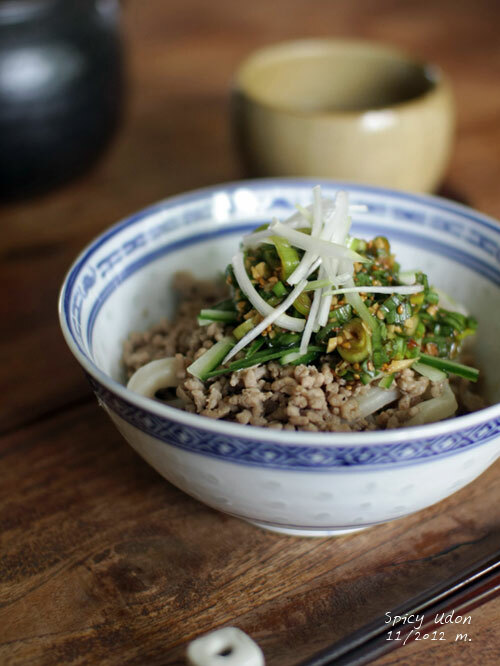 Serve immediately with sprinkle with the sesame seeds on top. 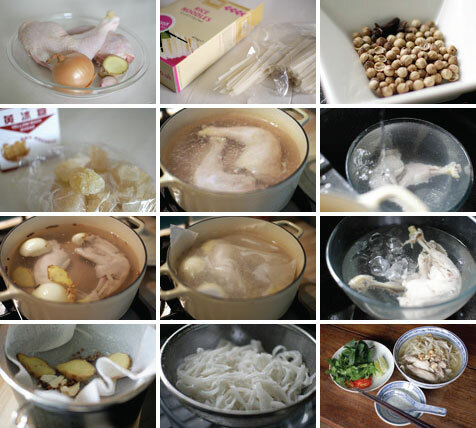 Boil the chicken in the pan with hot boiled water for about 10 minutes. Meanwhile, roast the peanuts in the small frying pan without oil. Discard the hot water and wash the chicken with cold running water. Remove any excess fat with your hands. Renew the 2,000 ml water and boil to a simmer. Add the chicken, onion, ginger, garlic, coriander and clove, cook for about 1 hour. Discard any scum with a ladle. Take the chicken out into iced water and break the meat roughly with your hands. Strain and heat the soup in a pan over a low heat and add the fish sauce and salt. Keep the soup hot. 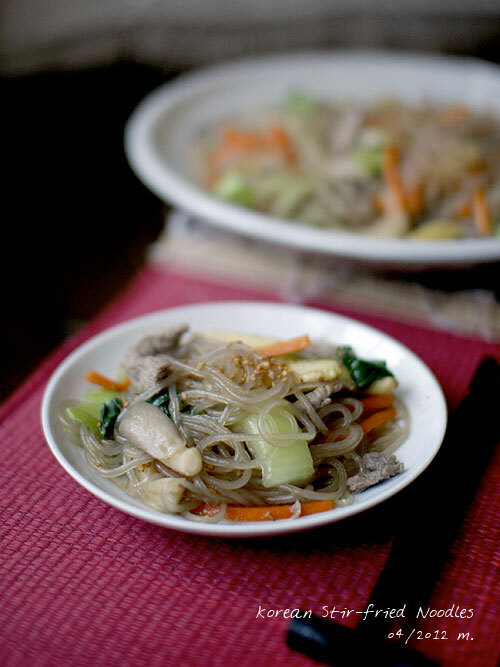 In a large bowl soak the rice noodles in hot water for about 15~20 minutes. Drain and wash with running water. Boil the hot water in the pan and warm the noodles. 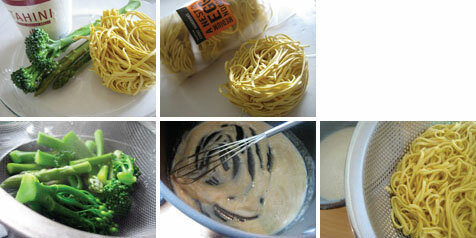 Divide the noodles into the individual bowl. Place the chicken. Pour the soup over the noodles and scatter with the peanuts. 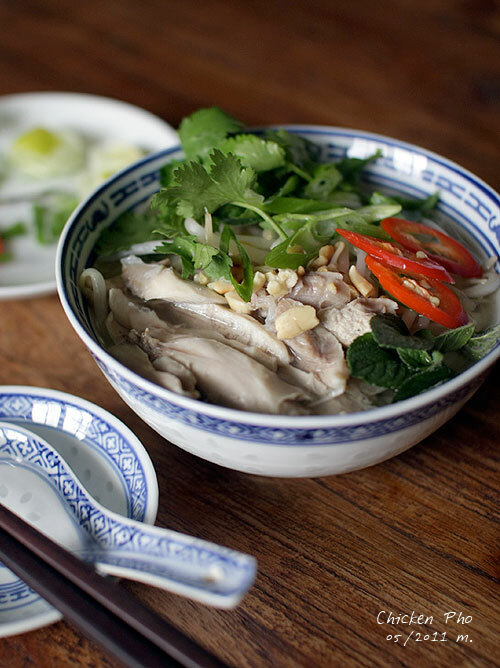 Serve immediately with the coriander, lime and chillies.